A unique blend of finishes makes this 8mm brushed and polished ring a top choice among designer cobalt chrome rings for men. An alternative to the ordinary wedding band, this 8mm ring is made from cobalt, a beautiful bright white metal that is both durable and strong. 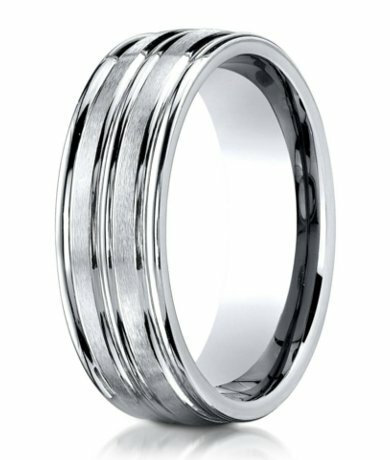 It has a double-grooved center band, two wider bands of brushed cobalt, and an outer polished edge on each side.Comfort fit rings usually measure 1/2 size smaller due to the additional metal inside the ring. We recommend having your finger measured for a comfort fit ring at your local jewelry store. I bought this ring for my husband for our 10th wedding anniversary. He's very happy with it, and it looks great on him. The band is nice and wide. The quality seems very good for the price. Great Quality, Price, Service. My husband loves his ring and we have already gotten so many compliments on this ring. Don't hesitate to buy this ring. It is perfect.